Figures released by Ruairí Quinn show that 55 people under the remit of the Dept of Education earn over €200,000 a year. 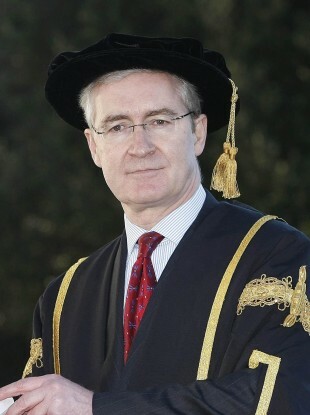 UCD president Hugh Brady, whose ten-year tenure ends this December, is one of the country's top public earners with a basic salary of over €200,000. A TOTAL OF 55 staff under the remit of the Department of Education and Skills earn more than the Taoiseach, it has emerged. Data published by education minister Ruairí Quinn shows that a significant number of staff – assumed to be employed at the country’s universities and institutes of technology – earn over €200,000 a year. That amount marks the ceiling for public appointees imposed by the current government after it took office – but the present government remains powerless to lower the salaries of college employees whose contracts predate the new limit. One person earns over €250,000 – the salary paid to the head of state, President Michael D Higgins. By comparison, 3,623 staff (or whole-time equivalents) earn under €25,000 a year, while 14,015 earn between €30,000 and €40,000 – putting them roughly equivalent with the average industrial wage of €36,182. A total of 1,525 staff under the Department’s authority earn over €100,000 per annum. The figures were revealed in response to written Dáil questions from former junior minister Róisín Shortall. Email “55 public-paid educators earning more than the Taoiseach”. Feedback on “55 public-paid educators earning more than the Taoiseach”.